Bus from KL to Melaka (Malacca) is one of the highest frequency routes departing from Kuala Lumpur TBS (Terminal Bersepadu Selatan). From morning as early as 1:20am until 11:45pm at night, almost every 30 minutes, there is a bus leaving TBS for Melaka. KKKL Express and Transnasional are the two famous brands serving buses from KL to Malacca. Locals prefer the two brands because of their punctuality and high frequency of schedule. Another relatively less famous but quality bus is Delima Express which is also reputable among locals. 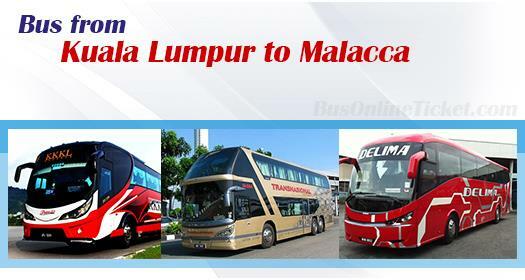 Their fare for bus from KL to Malacca is around RM 10.00 – RM 13.00 per ticket. Other bus operators offering buses from KL to Malacca include Maraliner, Mayang Sari Express, and Kejora Express. The bus fare ranges from RM 10.00 to RM 18.00 depending on your choice of bus operators. Only Mayang Sari offers a discount for children with a ticket price of RM 10.10 as compared to RM 11.00 for adults. The duration required for a bus trip from KL to Malacca is about 2 hours depending on traffic conditions. The arrival point in Malacca is at Melaka Sentral. However, Maraliner offers other drop-off points for passengers once they reach Melaka such as at Masjid Tanah Bus Terminal and UITM Lendu Bus Terminal. Washroom breaks will be provided upon request to the driver during the journey. Because of Malacca’s UNESCO world heritage status, Malacca is one of the top destinations for tourists coming to Malaysia. Usually, tourists will spend a few days to visit Kuala Lumpur attractions before heading to Malacca. As such, taking a bus from KL to Malacca is the easiest and most economical transportation option. For tourists who would like to take a bus from KLIA2 to Melaka after touching down, Transnasional is the only option providing the service. There are limited schedules for the bus from KLIA2 to Melaka daily, therefore customers are advised to check your arrival time which allows you to catch the bus from KLIA 2 to Melaka. Otherwise, you would have to take the shuttle bus provided by Jetbus from KLIA2 to TBS, and then transfer to another bus to reach Melaka. BusOnlineTicket.com now offers the option of making your ticket booking payment at 7-Eleven (limited to Klang Valley only). This is especially convenient for those who would like to book KL to Malacca bus tickets online but do not have a credit card. Passengers can book your KL to Malacca bus ticket online to secure your seat first before making payment by cash within 48 hours in any Klang Valley 7-Eleven outlet.